The structure of the Master of Management Studies: Duke Kunshan University program exposes you to the two most important economies in the world, providing a global launch pad. Starting on Fuqua’s campus in the U.S. and continuing your studies in China, you’ll gain a core understanding of business while developing the skills to build your career anywhere. The 10-month format gives you a firm foundation fast. In mid-July your program starts in Durham, NC with a launch experience and set of workshops that prepare you for the curriculum. It’s an exhilarating introduction to the international peer group you’ll be working closely with—in your section, and on your learning team. The rest of your program is organized into five 6-week terms. In January, after three terms at Fuqua, you’ll move to Kunshan, China for two terms on Duke Kunshan University’s campus outside Shanghai. In less than a year, you’ll be ready to start your career in finance, marketing, consulting, or general management. The program is delivered in English, and all classes are taught by Fuqua’s faculty. All Fuqua degree programs are taught by the same world-renowned faculty, scholars recognized for excellence in both teaching and research. The classes they teach are academically challenging and relevant to business today. Despite world-class credentials, your professors are highly accessible—with an open-door policy, they’re often happy to continue a classroom debate over coffee or lunch. Fuqua’s difference comes from the way we set up our MMS programs: as learning teams. You’ll be assigned to a small group representing a diversity of backgrounds, hand picked to ensure you learn from people who think differently than you. Replicating a corporate environment, your learning team works collaboratively on class assignments for the first three terms—giving you opportunities to learn and grow through shared problem solving and constructive debate. Teams reshuffle when you move to China, giving you the opportunity to practice your new collaboration skills with an entirely new set of classmates. Over five terms you’ll complete 15 courses: six in accounting, economics, and finance; two in analytics and critical thinking; two in communication and leadership, and five in markets, strategy, and management. You’ll take multiple subjects each term, with each class meeting twice a week for 2 hours and 15 minutes. 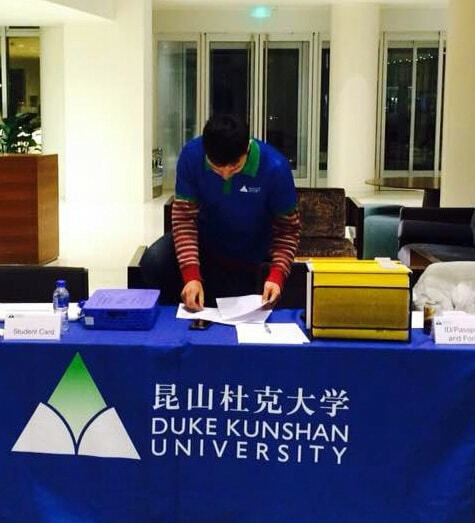 Your first three terms are taught on Duke’s campus in Durham, North Carolina, with your final two terms at Duke Kunshan University outside Shanghai. Team up in the U.S. and China. Learn all the basics while building professional skills. Explore how it’s done in the real world. Launch your career with us by your side. Make yourself at home on two campuses.